We love Studley Park Boathouse. It holds a long tradition of picnics and outings within our family. 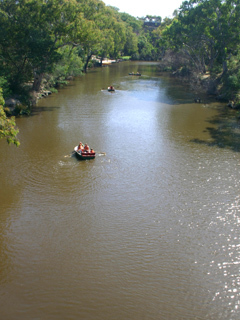 It is situated on the Yarra River in Kew, and not far from the city. To get there, you can drive there along the Yarra Boulevard or along Yarra Bend Road from Fairfield. If you come from Yarra Bend Road, your car crosses the ‘hanging bridge’, which the kids always love. The boathouse is down on the banks of the River. It is really serene down there. Kids can bring their scooters, bikes and they’ll especially love crossing the hanging bridge and feeding the ducks. 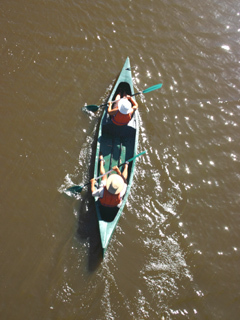 An extra special treat is to hire a rowboat or canoes. They let you take the boats under the hanging bridge up river where there are birds and trees hanging over the water, and lots of things to see. 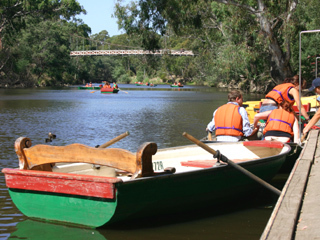 The boat house is one of the original 1860s Melbourne icons. At the kiosk you can get coffee without burning the family budget, and it’s good! There are also tables and chairs overlooking the river – pretty nice. There is also a café and classy restaurant which is a little on the pricy side, but does look tempting. Studley Park Boathouse is a place where kids can still be in nature and don’t have to be entertained (that’s a relief to any parent). They are just as happy playing with sticks and running around and don’t usually want to leave. Really highly recommended! Nice Post thanks for sharing. Keep it up. I love the boat house!!!. It's the best place to have drinks, lunch or dinner & relax with the one you love or the ones you're with. Nice art, Absolutely awesome, that guy had a good talent. Hope to see more posts here.. I always take interest to read your Post..thanks for sharing. I always take interest to read this type of Post..thanks for sharing. for students at an affordable price. Homework counseling services for student for getting higer grades. Nice post but guys i ask why you don't know update your site with some great blogs like this. Just my advice is you should update your site as soon as possible. It is extremely helpful for me.Excellent and decent post. I found this much informative, as to what I was exactly searching for. Teacher returns test after checking and announced the results of students in test. Students got their results. We check the advancement of your writing topic and include it in your writing. Our college paper writing service reviews can found here So that you can improve your writings after getting satisfaction. Yes, We love this too! We have taken our bikes there, which is a great trip too. You turn off the Capital City Trail just above Dwight's Falls, then trail along the Yarra Bends and cross the hanging bridge at Studley Park Boat house. Join in and write your own page! It's easy to do. How? Simply click here to return to Kids Activities.